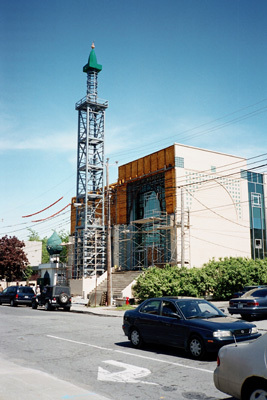 The Islamic Centre of Québec (ICQ) is the first mosque built in Montreal and in the Province of Québec. Its history dates back to the mid-nineteen-fifties in Montreal when a few Muslims prayed privately in their homes. When they were together on the weekend, they offered their prayer in a group. They were the nucleus which formed the Islamic Centre of Montreal, incorporated in 1958 with constitution and bylaws in the province of Québec. Its main objective was to preserve Islamic heritage and create an Islamic environment for Muslim immigrants and their growing children. 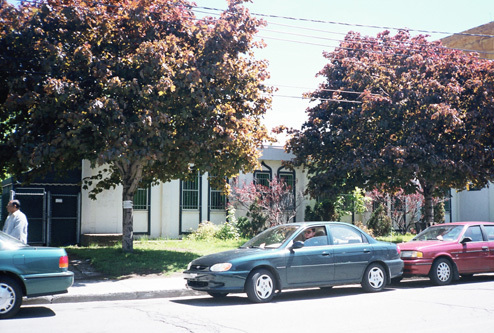 Seven years later, the Islamic Centre of Québec was established through a private bill (Bill 194), assented to by the National Assembly of Québec, on August 6, 1965. For earlier beginnings, please see the website www.mrsp.mcgill.ca under special reports "Story of Indo-Pakistani Muslim Community in Montreal, Québec" narrated by Mumtazul Haque Rehman. 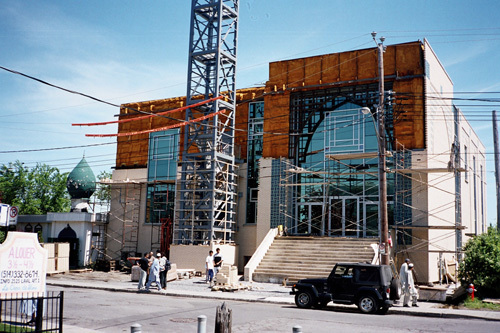 The Mosque is now (2003-04) in the midst of Phase I of third extension which will add two new floors over the 1985-86 addition, and a new entrance. The plan of Phase II, will incorporate the old mosque hall into the present addition, by raising its ceiling and roof, so that the upper two floors will look over the main hall and mehrab and provide a view of the Imam delivering congregational addresses and lectures. When completed, it will accommodate 1000 persons during congregational prayers, with a separate hall for women and girls. In addition to creating an adequate place for ablution, separate for men and women, it will house other facilities including a large meeting room, library, offices for the Imam and secretariat, a bookstore, classrooms, washrooms on each floor, a kitchen, a cloak room with shoe racks near the entrance, a washing facility and overnight storage refrigerator for the bodies of the recently deceased. The Islamic Centre of Québec mosque is self-governing. The ICQ is a democratically elected Islamic organization and its affairs are managed according to the By-Laws of the Islamic Centre of Québec, which are revised from time to time to address new situations. Presently the authority rests with two bodies, the Consultative Assembly (Majilis-e-Shura) and the Executive Council. In addition, there is an independent board which administers the Islamic cemetery. The Majilis-e-Shura exercises the rights and powers of the general membership of the ICQ, consisting of twelve members. Shura members have a term of three years. Its responsibilities consist of long range planning, framing policies and advising and assisting the Executive Council. The Executive Council consists of seven members with four members from the Shura and three from general membership, and is elected by the Shura; it is responsible for managing day to day affairs of the centre. The President and the Secretary must be from the Shura. A Religious Committee handles all matters relating to Islamic practices, Islamic law of jurisprudence (Fiqh). The Imam is the chairperson of this committee. The mosque is entirely funded from the contributions of the Muslim community who come for the congregation prayers. Fund raising functions such as dinners and bazaars are held when funds are needed for a specific purpose. Members of the Shura and the Executive Council work on a voluntary basis. Maintenance of the facilities is covered from the funds collected. The accounts of the centre are kept by the Treasurer, who is a member of the Executive Council and is generally a chartered accountant. Tax-exempt receipts are issued by the Treasurer. An external audit is carried out yearly by a chartered accountant, appointed by the general membership at the annual general meeting. The Muslim Community is multi-ethnic and its members come from all over the world. The majority comprises of landed immigrants and Canadians from India and Pakistan and the Arab world. There are also people from Indonesia, China, Malaysia, Turkey, Africa, the Caribbean Islands and many European countries as well as Afro-Americans. In general, one can hear English, French, Arabic and Urdu spoken in the centre. The Khutbas and talks (speeches) are in English and Arabic. Muslims of all age groups are fairly represented, notably Canadian-born young people. To make Islam better understood as a complete way of life, based on the Quran and Sunnah of Prophet Muhammad (peace be upon him). To promote unity and brotherhood among Muslims. To organize religious and social activities as permissible in Islam. To promote Islamic Da'wah (inviting people to Islam) with wisdom, spirit of good will, and friendship for followers of other faiths. To provide educational facilities to the Muslim community. To extend help to newly arrived Muslim immigrants in settling down in Québec, to unemployed members of the Muslim community, and to Muslim students for the pursuit of their endeavors. To prepare publications on Islam. To ensure that the organization is managed without any inappropriate financial gain for its members. Five daily prayers are regularly performed in the mosque. The exact times of prayers change with the season. Each prayer takes an average of five to fifteen minutes to complete. The Friday prayer is decreed in Quran (chapter lxii, 9-10, Al Jumu'a) and thus recommended for all adult Muslims. In earlier years in this mosque, the sermon (khutba) preceding the prayer was only in Arabic; but for people who did not understand Arabic, the message went over their heads. However, a brief English translation is delivered by Imam before the start of the prayer. It is not very effective and certainly not the best format. All Islamic festivals, celebration etc are based on Islamic calendar, which is lunar. The lunar calendar is 10-11 days shorter than Gregorian calendar and hence it repeats every 36 years. Consequently, all special celebration days vary from year to year. There is a special Isha prayer (Traweeh) during the month of Ramadhan (fasting), when the recitation of Holy Quran is completed in full. It is the ninth month of the Islamic calendar. Boys in two groups, six times a week (2 hours), depending on age. Girls in two groups, four times a week (2 hours), depending on age. Group meetings (Halqa) daily after Maghrib prayer. The meetings are attended by people who stay back after the prayer to discuss certain aspects of religion. Meetings of the Executive Council as needed. Marriage ceremonies, their registration, registration of births and deaths in accordance with Civil Status requirements. Administration of Muslim Cemetery, washing, and storing of the bodies of the deceased overnight and burial arrangements. Quarterly newsletter and notices of General and Special meetings.